The homes we’re showcasing may be tiny, but this year’s St. Pete Tiny Home Festival will be anything but small. The festival will take place April 7-8 at the SPC Allstate Center, and Ivy Group’s Sustainable Living Foundation is thrilled to be co-organizing it along with LocalShops1. Festival goers will be able to tour and meet the owners of over 25 tiny homes, skoolies, and converted vans, and participate in workshops presented by tiny home experts. 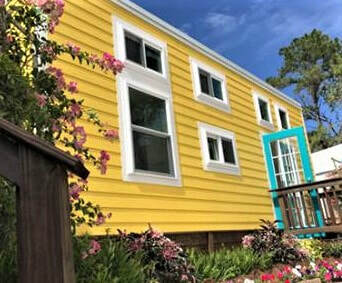 Talks and workshops at the Tiny Home Festival will feature visionaries, champions, and trailblazers from Florida’s thriving tiny home culture. From designing and building tiny homes, tiny home communities and lifestyle, to the evolution of codes and standards, there’s a topic for everyone, from the budding enthusiast to the most devoted propeller of the tiny lifestyle movement. Ivy Group’s Sustainable Living Foundation (SLF) is a driving force within the tiny home movement in St. Petersburg. As forensic architecture experts for over 30 years, we have extensive familiarity with local, state, and international building code and zoning matters. This background is invaluable to our clients in navigating the regulatory approval process – a crucial stepping stone for those trying to turn their tiny home dreams into reality. In January, we consulted with the St. Pete Eco-Village to help them prepare and present their Application for a Special Exception to the Pinellas County Development Review Commission. Their application was the first of its kind to be approved in St. Petersburg, and they’re now eagerly preparing to build three tiny homes on foundations on their land! In addition to the eco-village’s approval, SLF is encouraged by the City of St. Petersburg’s discussion of creating of a “Cottage Courtyard” zoning description, which could allow 3-5 tiny dwellings on a single lot. Tiny homes on foundations are currently considered an “accessory dwelling unit,” only permitted as a backyard companion to a regular-sized residence. The advent of Cottage Courtyard zoning would allow for the development of tiny home communities that fill not only sustainability needs but social needs as well. Like SLF, some of the Tiny Home Festival‘s experts are working to ease the tiny home construction process for citizens and governing bodies. Presenters Bildsworth International and Trekker Trailers are working to establish tiny home certification standards that would meet 99.5% of state and local building regulations nationwide. Our Sustainable Living Foundation has grown out of the hearts and values of our team. Scott Bitterli and Bob Bitterli are walking their sustainability talk. 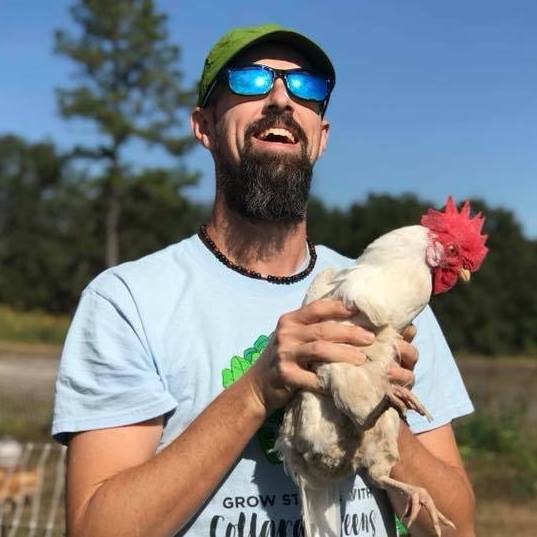 Scott and his partner Jasmina recently finalized plans to co-create a shared living situation with friends, on land with chickens and edible landscaping. They will take on this challenge and adventure as they contemplate building their own tiny home. 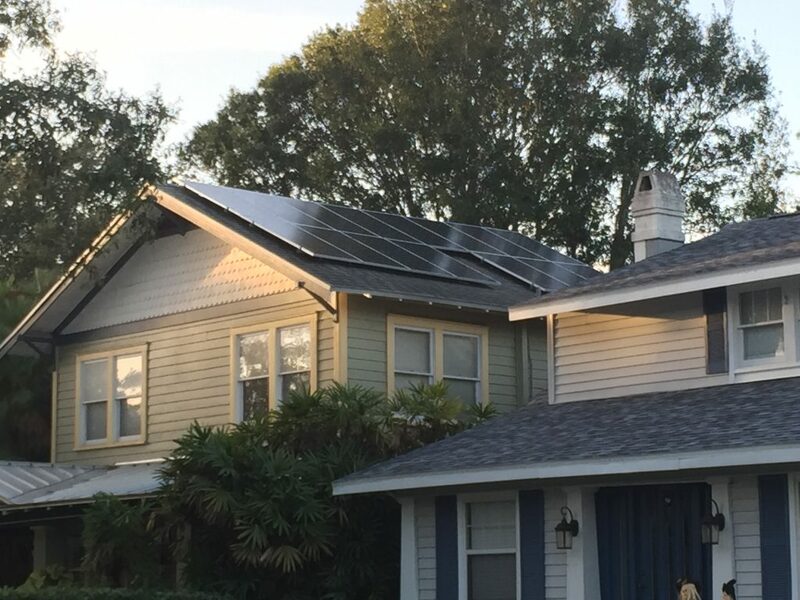 Founder Bob Bitterli’s home produces more energy than it consumes using PV solar panels. One of main drivers for people wanting to live in tiny homes is a desire to live off the grid. While Bob isn’t going tiny, he’s improved the efficiency of his 1917 home (and saves $120 per month!) by adding 27 state-of-the-art photovoltaic (PV) solar panels to the roof. The excess electrical power produced by the panels is passed on to the power grid, and turned into credit on the home’s electric bill. Scott was recently featured on WMNF’s Sustainable Living hour, along with Chris Kendrick, co-founder of the St. Pete Eco-Village in downtown St. Petersburg, and tiny house advisor Pat Dunham. Listen to the March 26 episode for more about St. Petersburg’s tiny home movement and the upcoming Tiny Home Festival.